Occurrence: Salmon from both recreational catches and commercial landings is eaten after cooking from fresh fish. Smoked salmon is likely to have allergenic properties similar to ordinary fish. Canned salmon may have reduced allergenicity as is found with tuna. 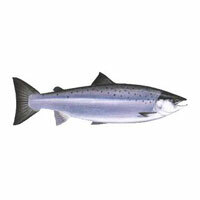 The Atlantic salmon, Salmo salar, NEWT 8030, is the salmon species in most publications on food allergy. Rainbow trout or steelhead salmon, Oncorhynchus mykiss, NEWT 8022. However, there are also unrelated fish called salmon such as the Western Australian salmon, Arripis truttacea, ITIS 645562. Most articles mentioning allergy to salmon describe allergy to fish in general without attributing symptoms specifically to salmon. For example, Helbling et al. (1996)  describe the symptoms of 39 patients as pruritus (27/39), hives (27/39), asthma and wheezing (21/39), angioedema (20/39), dyspepsia and cramps (7/39), vomiting (3/39), shock (3/39) and fainting (2/39). 13/39 patients had a history of allergic reaction following ingestion of salmon, 16/39 had a positive SPT and 13/24 a positive RAST to salmon. Helbling et al. (1996)  made an extract of Alaska pollack and of 4 crustacean species. 16 commercial extracts of fish, including salmon, and 12 commercial extracts of inhalant allergens were also used . Bernhisel-Broadbent et al. (1992)  added 10 g. of raw and cooked fish (catfish, bass, perch, mackerel, tuna, salmon, trout, codfish and flounder) to 40 ml. phosphate buffered saline in centrifuge tubes with a glass marble. The tubes were placed in a test tube rotator overnight at 4°C. Samples were centrifuged at 1250 x g for 15 min and then at 16000 x g for 15 min. Supernatants were lyophilized. Skin tests used 1:20 (w/v) saline diluted extracts of raw fish. Helbling et al. (1996)  tested 39 fish allergic study subjects with salmon together with 18 atopic control subjects. Helbling et al. (1996)  found that 16/39 fish allergic subjects gave a positive skin test to salmon. Bernhisel-Broadbent et al. (1992)  reported that 9 patients showed a positive SPT to salmon with 4-19 mm wheal diameters. This similar to several other fishes and was a smaller response than to cod but greater than to sardine or tuna. de Martino et al (1990)  reported that 4/20 of the cod allergic children reacted to salmon extract. None of the cod negative children reacted. Helbling et al. (1996)  made an extract of salmon (and of Alaska pollack, anchovy, mackerel, rainbow trout, and tuna) by blending 500g of raw fish in 1L of 0.01M PBS, pH 7.2, in a Waring blender for 1-3 minutes at room temperature. The mixture was extracted overnight at 4°C and centrifuged (70,000 g). Supernatants were concentrated with an Amicon YM1 filter (molecular weight cut-off 1 kDa) and recentrifuged (180,000 g). Bernhisel-Broadbent et al. (1992)  used extracts as described for skin tests by Bernhisel-Broadbent et al. (1992)  but also made extracts from fish which were cooked and lyophilized to mimic the DBPCFC conditions and from fish which were cooked. Bernhisel-Broadbent et al. (1992)  and Bernhisel-Broadbent et al. (1992)  used immunoblotting and Bernhisel-Broadbent et al. (1992)  used ELISA inhibition. Helbling et al. (1996)  tested 24 sera from fish allergic patients with salmon. Bernhisel-Broadbent et al. (1992)  tested 6 sera from fish allergic patients. Helbling et al. (1996)  reported a positive RAST with salmon for 13/24 fish-sensitive subjects. The proportion of positive responses varied from 8/11 for cod and 8/12 for haddock to 4/29 for anchovy and 5/27 for tuna. It had been suggested that some positive SPTs with commercial fish extracts were due to histamine contamination and in this study 13/18 and 5/18 atopic controls reacted to anchovy and tuna respectively. However, the correlation for salmon between RAST and SPT results with 10.1% of radioactivity bound by sera from SPT positive subjects and 1.7% bound by sera from SPT negative subjects suggests that SPT results were not influenced by histamine. RAST inhibition of IgE binding to trout extract was greatest for salmon extract, 80%, with pollock giving 50% and tuna near 40% inhibition. Salmon extract gave 40% inhibition of mackerel RAST. Bernhisel-Broadbent et al. (1992)  reported that binding of serum IgE from 2 salmon allergic patients could be inhibited by cooked salmon, trout and flounder extract but not by milk whey. This suggests that almost all salmon allergenicity is due heat stable conserved proteins such as parvalbumin. Immunoblotting detection method:Bernhisel-Broadbent et al. (1992)  and Bernhisel-Broadbent et al. (1992)  transferred proteins electrophoretically onto nitrocellulose membranes in Tris-glycine buffer (pH 9.1) containing 20% (v/v) methanol. These were blocked in PBS with 0.5% porcine gelatin and 0.05% (v/v) Tween 20. The membranes were probed with 1:25 (v/v) diluted sera from fish allergic patients. Bound IgE was revealed by biotinylated goat anti-human IgE, followed by reaction with an enzyme horseradish peroxidase-avidin-D solution (Vector Laboratories, Burlingame, CA). Bernhisel-Broadbent et al. (1992)  showed that IgE from the sera of a salmon allergic patient recognised a 13 kDa allergen in extracts of several raw and cooked fish (catfish, bass, perch, mackerel, tuna, salmon, trout, codfish and flounder extracts were tested). Tuna and flounder did not show binding. Sera from a flounder allergic patient did not recognise salmon extract but showed the 13 kDa band with catfish, bass, perch and mackerel. Bernhisel-Broadbent et al. (1992)  used sera from the same salmon allergic patient, who had only reacted to salmon by open challenge, and reported that 13 kDa protein in both the lyophilized and non-lyophilized salmon extract bound IgE similarly. Bernhisel-Broadbent et al. (1992)  used canned salmon for open challenge. Bernhisel-Broadbent et al. (1992)  used blind challenges which if negative were followed by open challenges. Bernhisel-Broadbent et al. (1992)  reported 50 oral challenges with 12 fish species to 11 patients. 6 individuals were challenged with salmon. Bernhisel-Broadbent et al. (1992)  report that a patient reacted to salmon with oral pruritus and cutaneous symptoms. Another patient only reacted on open challenge with oral pruritus and gasterointestinal symptoms. 4 patients did not react to salmon although some of these did react to other fish. There were an unusually large number of false negative challenges over all the fish (7/33 or 21%) but Bernhisel-Broadbent et al. (1992)  reported that the lyophilization for DBPCFC did not alter IgE binding (see immunoblotting above). Bernhisel-Broadbent et al. (1992)  reported only negative challenges with canned salmon and tuna. They also note that fish allergic patients had been able to eat these canned fish normally for 2 years. This was attributed to the very long heat treatment of the canning process of approximately 14 hours. Van Do et al (2005)  used SPT and ELISA inhibition with 12 patients and their sera to characterize the cross-reactivities of native and some recombinant parvalbumins from 9 species (cod, Gadus morhua, Atlantic salmon, Salmo salar, Atlantic mackerel, Scomber scombrus, tuna, Thunus albacares, herring, Clupea harengus, wolffish, Anarhichas sp., halibut, Hippoglossus hippoglossus, flounder, Platichthys flesus, and Alaska pollack, Theragra chalcogramma). Cross-reactivity was generally observed although some parvalbumins and extracts were poor inhibitors of IgE binding to cod for some sera i.e. 2/10 sera did not show inhibition by salmon parvalbumin (although surprisingly recombinant salmon parvalbumin caused inhibition). Tanaka et al. (2000)  used cross-reactions to cluster seafood allergens into 4 groups with salmon, sardine, horse mackerel and mackerel in a group apart from cod and tuna. As histamine is the main mediator of IgE mediated allergic reactions, the symptoms of histamine poisoning are similar to allergy to fish (Ohnuma et al. 2001 ; Attaran & Probst, 2002 ). Although histamine toxicity is normally associated with scombroid fish (mackerel, tuna, marlin, swordfish, albacore, bonito, skipjack, and almost 100 other species) which have a high concentration of histidine as a pH buffer, similar reactions have also been reported from several other (non-scombroid) species of fish including salmon (Gessner et al 1996 ; Smart 1992 ). Aasmoe et al. (2005)  report occupational allergy to salmon. Allergy to salmon caviar seems to be distinct from allergy to fish muscle. Flais et al. (2004)  describe a patient who experienced anaphylactic shock on her initial ingestion of salmon caviar, although she had previously comsumed salmon flesh without symptoms. Makinen-Kiljunen et al (2003)  report serious symptoms in 2 patients after consumption of rainbow trout and whitefish roe. Both patients could consume fish muscle without problems. Kondo et al. (2005)  reported that there was no correlation between IgE binding determined by RAST to extracts of salmon muscle (Oncorhynchus kisutch) and of salmon roe (Oncorhynchus keta) using sera from 27 fish allergic patients. Kondo et al. (2005)  also used sera from 2 patients who had anaphylaxis after consuming salmon roe and from a third who avoided both salmon and salmon roe because of high IgE levels with salmon, salmon roe and chicken egg white. ELISA inhibition with these three sera showed cross-reaction between salmon and herring roe. Weaker inhibition was seen with pollock roe and with salmon extract. No inhibition was seen with hen's egg. Immunoblotting showed IgE binding to salmon roe at 15 and 17 kDa with the sera from the patients who had reacted. The third patient's sera bound to a 21 kDa band. N-terminal sequences suggested that all the bands were fragments of vitellogenin. The 15 and 17 kDa bands were from the beta'-component while the 21 kDa band may have been lipovitellin. Untersmayr et al. (2002)  report a single patient who experienced local symptoms (angioedema of the oral and laryngeal mucosa) and systemic symptoms (wheezing, hypotension and gastric cramps) within minutes after consuming beluga caviar on three occasions. This patient's serum contained IgE binding to bands at masses of 30, 84, 100, and 118 kDa from sturgeon caviar and less intense IgE binding to a 73-kDa band in lumpsucker and an 82-kDa band in trout and salmon caviars. These authors also suggest that the 118 kDa protein might be vitellogenin. Flais MJ, Kim SS, Harris KE, Greenberger PA.
Lindstrom CD, van Do T, Hordvik I, Endresen C, Elsayed S.
Cloning of two distinct cDNAs encoding parvalbumin, the major allergen of Atlantic salmon (Salmo salar). Expression and analysis of recombinant salmon parvalbumin, the major allergen in Atlantic salmon (Salmo salar). Gessner BD, Hokama Y, Isto S.
Scombrotoxicosis-like illness following the ingestion of smoked salmon that demonstrated low histamine levels and high toxicity on mouse bioassay. Dreyfuss G, Choi YD, Adam SA. Characterization of heterogeneous nuclear RNA-protein complexes in vivo with monoclonal antibodies. Kondo Y, Kakami M, Koyama H, Yasuda T, Nakajima Y, Kawamura M, Tokuda R, Tsuge I, Urisu A.
Untersmayr E, Focke M, Kinaciyan T, Poulsen LK, Boltz-Nitulescu G, Scheiner O, Jensen-Jarolim E.
Anaphylaxis to Russian Beluga caviar. Allergen epitopes:Bugajska-Schretter et al. (1998)  show that IgE binding to carp beta-parvalbumin is very much stronger in the presense of calcium, when the protein is in its native folded form, suggesting that the epitopes are primarily conformational. Lindstrom et al. (1996)  report IgE cross reactivity between cod and salmon parvalbumins. Bugajska-Schretter et al. (1998)  reported inhibition of IgE binding to salmon extract after preadsorption of 4 sera with cod extract was 52%, 96%, 74% and 87% for salmon. Bugajska-Schretter et al. 2000  report that preabsorbtion of sera from 11 fish allergic patients by carp parvalbumin caused mean inhibition of IgE binding of 78% to salmon extract (55%-93%). Van Do et al (2005)  used SPT and ELISA inhibition with 12 patients and their sera to characterize the cross-reactivities of native and some recombinant parvalbumins from 9 species with cod. For most sera, both native and recombinant salmon parvalbumins caused significant inhibition of IgE binding to cod parvalbumin. However, for 2/10 sera, native salmon parvalbumin did not cause inhibition, although surprisingly recombinant salmon parvalbumin caused inhibition, and with 2 further sera inhibition was weak with both native and recombinant salmon parvalbumin. Most fish beta-parvalbumins are acetylated at the N-terminus and Lingstrom et al (1996)  reported that the N-terminus of salmon parvalbumin was blocked. Lindstrom et al. (1996)  report purification of two parvalbumins by anion exchange chromatography, gel filtration chromatography and high-performance liquid chromatography of salmon muscle extracts. Van Do et al (1999)  report production and purification of both parvalbumins as recombinant His-tag fusion proteins using an Escherichia coli expression vector (pET-19b). The His-tag could be partially removed by digestion with enterokinase. The proteins without the His tag showed a MW similar to that of the native protein. Longer digestion or a larger enterokinase concentration led to further degradation of the proteins. There are two families of beta-parvalbumin sequences in several fishes. One group includes Q90YK7 (Alaska pollack), Q91482 (salmon) and Q90YK9 (cod) and the other Q90YK8 (Alaska pollack), Q91483 (salmon) and Q90YL0 (cod). Each groups shares approximately 75% sequence identity and each sequence has 65-67% sequence identity with members of the other group. Q91482 and Q91483 are 65-67% identical.